Q1 of 2016 has already been quite busy with the organisation of VISUG 10 Years and the upcoming conference Techorama 2016. The user group and all community activities are simply not a simple side job anymore. For the celebration of VISUG 10 years I delivered a session DevOps with Visual Studio Release Management. 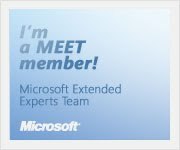 In March (part of a Techorama 2016 promo tour), I will be travelling to Scotland for a User Group Talk in Glasgow (March 10): Advanced Techniques for Web Deploy (msdeploy) to simplify the deployment of web applications. The next day (March 11), I will again deliver my DevOps with Visual Studio Release Management talk in Edinburgh. Thanks to the Scottish Developers User Group for setting this up! Today I delivered a session at the VISUG event on Visual Studio Release Management. I was pretty amazed with the number of people who showed up from the beginning. Usually we have quite a high no-show rate for our User Group sessions, but this time I guess that everybody was present! Thanks for all the people who joined one of our sessions today! The interest in a decent Release Management strategy/solution is increasing quite fast these days. For a few of my customers, I’m also involved in some POCs to demonstrate the power of the Release Management features in the Visual Studio offering and the feedback is very promising. My slides of today can be downloaded here and more general info can be found at the Microsoft product page. Last important remark: using the latest Visual Studio Release Management features (part of the VS 2013 release) doesn’t require you to have TFS 2013. You can point the Release Management Server also to TFS 2010 and TFS 2012. If you might be interested in an on-site session on this topic for your user group / company, please contact me via this contact form. A few weeks ago, I started with publishing different parts of an article on the evolution of Application Lifecycle Management. Part II: Diving into the basics of ALM and how did Microsoft start with an ALM solution? You can now also download the full article in pdf-format (25 pages in total – 2MB). I have been a “Team System” user/advocate from the early beta versions in 2004 and it’s amazing to experience at short range what has been delivered with all releases of Team Foundation Server to improve the quality and predictability of software development. While the first release wasn’t all that glamorous to get up-and-running, it has definitely started a complete new way of collaborating as a team in software development projects. Nevertheless IT software development projects still have a very bad reputation to deliver quality software on time and on budget. Often this is due to a lack of experience and a lack of software craftsmanship, but on many projects it’s also due to lack of a decent ALM vision and strategy. In a world where software is eating the world, all companies are becoming a software company and should invest in adopting Application Lifecycle Management. It’s not about writing some code that runs on one specific box, but it’s about bringing value to the market for the consumers of your product in a reliable and sustainable way. That’s why I like so much the cloud story for TFS and the increased delivery speed of new features. 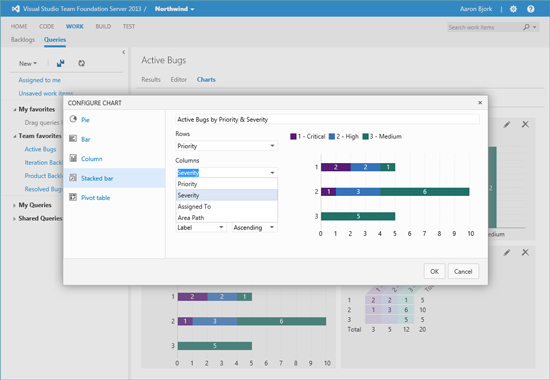 Have a closer look at the details in the Features Timeline page on Visual Studio Online to discover what has been released in the latest months. The last few years have been extremely interesting for those people living in the ALM space. The evolution of ALM tools in the market has been phenomenal. From very specific niche tools of small companies to the more all-in-one solutions of the traditional big players like HP, IBM and Microsoft. The specific niche tools are more widespread in the startup landscape and might often be the best fit for one specific purpose. The big vendors on the other hand will always have their place in large organizations, but the challenge will remain to integrate all active ALM related tools to improve the collaboration and efficiency between different stakeholders. Many people are still keen to have quick access to the data they need within their tool of choice (whatever tool is perceived as the master ALM tool). Data will need to synchronize flawlessly across different ALM tools/solutions without losing focus on the value of a corporate ALM strategy. Companies like TaskTop and OpsHub are already playing an important role in this area. Another important evolution of Microsoft’s ALM solution has been to also support non-Windows environments. Team Explorer Everywhere (TEE) was the result of specific attention for cross-platform collaboration from a dedicated group inside Microsoft (after buying Teamprise). Nowadays, all different TFS product teams inside Microsoft share a common vision to deliver ALM features for hybrid environments with extensibility in mind. With the recent announcements of Application Insights and Monaco, Microsoft demonstrates to drive the industry further in an improved and fast Build-Measure-Learn cycle (Lean ALM) with an increased focus to embrace the opportunities of cloud computing. I would like to finish off with a link to the recent publication of the new Gartner report (November 19, 2013) on Application Development Lifecycle Management where Microsoft has been identified again as leader in the Magic Quadrant. Microsoft is a Leader in the ADLM market with a strong customer base and partner base, together with a solid stream of innovation. Microsoft offers one of the broadest sets of ADLM functionality available in the market; second only to IBM. Since delivering the Azure-based version of Microsoft TFS, the vendor has moved to a consistent release train, moving new features first to the cloud-based versions and then into on-premises releases. An important trend which continued to be reflected in the 2013 release is the improved integration towards other Microsoft products (for example System Center and Windows Azure). In that respect we will probably also see some upcoming modifications in the integration with InRelease, a release management solution from InCycle. Microsoft reached an agreement to acquire InRelease on June 3, 2013. The solution allowed software development teams to automatically deploy and track applications (from Team Foundation Server) as a whole to multiple environments – up to production – based on a business-approval workflow. While the official release of Visual Studio 2013 was planned on November 13 with the Launch Event, the RTM bits were already made available on October 17, 2013. The Cloud Loud Testing feature to provide virtual machines that generate the load of many users accessing your website at the same time. 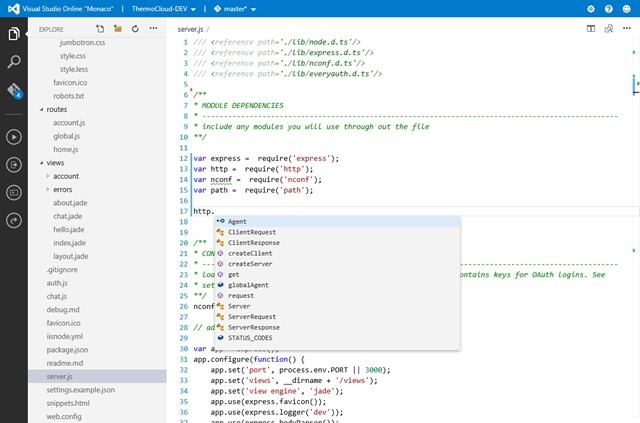 The Connected IDE: Sign in to Visual Studio! The interesting Azure benefits with MSDN Subscriptions to develop and test in the cloud for free using monthly credits. But, important new announcements were made at the official Launch Event. Team Foundation Service became Visual Studio Online in the perspective of broadening the complete offering to indicate that Visual Studio Online will become the services component of the developer tools for the future. 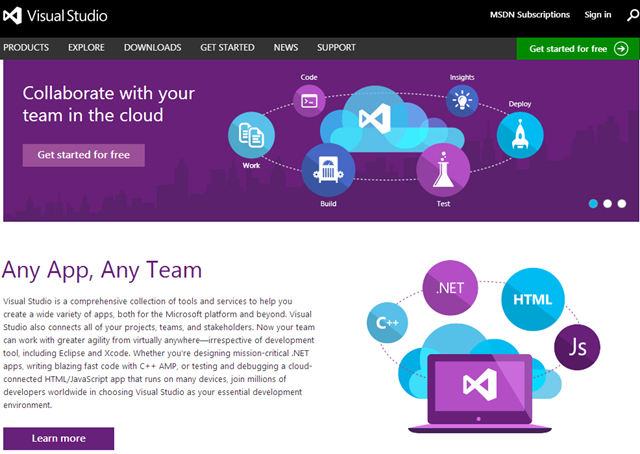 Visual Studio Online, formerly Team Foundation Service, is the home for your project data in the cloud. Get up and running in minutes on our cloud infrastructure without having to install or configure a single server. Set up an environment that includes everything from hosted Git repos and project tracking tools, to continuous integration and an IDE, all packaged up in a monthly per-user plan. Connect to your project in the cloud using your favorite development tool, such as Visual Studio, Eclipse or Xcode. Visual Studio Online is now running in Commercial Preview mode (paid usage is enabled and price plans have been announced) and will shift to General Availability somewhere in 2014, after all billing services have been put into place. Until that time, everyone may still freely use the system as an early adopter. Cloud Build and Cloud Load Testing as described above are already part of the released features of the service, while 2 new preview features have also been announced at the Visual Studio 2013 Launch event: Application Insights and Monaco. This Visual Studio Online feature now provides a 360 degree view of running applications by collecting, processing and displaying a wide variety of telemetry in three areas: performance, usage and availability. Without any effort during the development lifecycle (seamless integration experience), development teams will benefit from the extensive set of collected diagnostics to analyze what’s going on in their deployed applications. With these valuable insights, future (to-be-developed) improvements can be more focused and impactful. Application Insights will be able to deliver the required metrics to adopt validated learning and to move into a real Build-Measure-Learn cycle. Time to wrap-up this article on the evolution of ALM/TFS in the final Part VII. 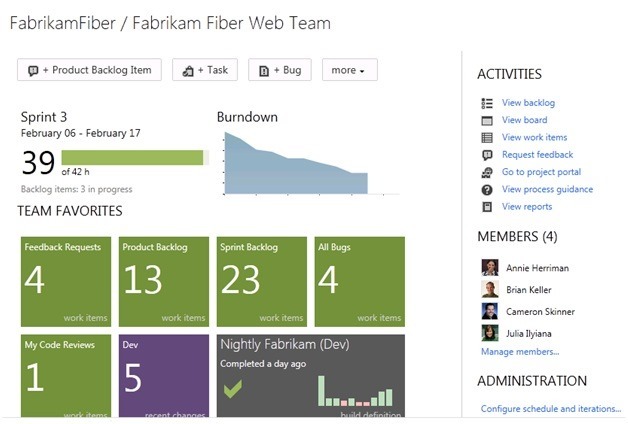 The next major release of Team Foundation Server (TFS 2012) was released on September 12, 2012. 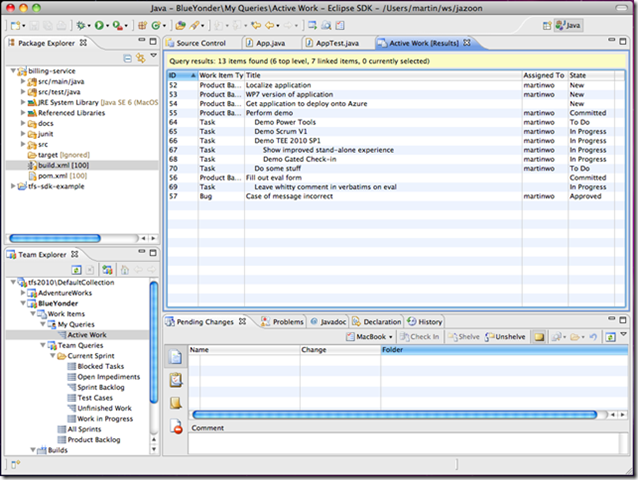 Some of the key new features in this release were full integration of Agile Project Management through a new improved Web Access UI, involvement of feedback from other stakeholders in the software development process by using PowerPoint StoryBoarding and the Feedback Client, increasing the productivity of developers by introducing a new Team Explorer UI and by providing important version control enhancements like the availability of Local Workspaces. The main theme of this release was Continuous Value Delivery. TFS 2012 delivered workflows and tools that are able to shorten delivery cycles, include customers and operations (non-development stakeholders) in software construction, and it looks for opportunities to reduce waste in the software development process. As a result, your organization should be able to reduce risks, solve problems faster, and continuously deliver value that exceeds customers’ expectations. Prioritize collaboration among everyone involved in developing an application, incorporating customers as equal members of the development team. Deliver timely and actionable feedback to reduce wasted effort and its associated costs. Provide natural and appropriate tools for the tasks involved in designing, developing, testing, delivering, and maintaining quality software. Support best practices for application development, while remaining independent of any specific methodology. Reflecting on the impact this release had for many of my customers, it must have been the best release of Team Foundation Server. The majority of the new big features were easy to demonstrate and it didn’t take long to convince decision makers of the business value to upgrade old TFS environments to TFS 2012 or to introduce it to new customers who were struggling with implementing ALM in general. There were so many known pain points in software development tracks which could benefit heavily from built-in solutions in the TFS 2012 release. Think about for instance the possibility to shorten the feedback loop between business and the development team, but it also included important development productivity features like explicit code reviews in the daily workflow of developers and the inclusion of a new improved diff/merge experience. After feeling a bit lost in the redesigned Team Explorer UI in the beginning, it became clear that it focused more on a task-oriented approach, freeing the development team from many of the distractions that can occur when working on a complex project and enabling the team to work more quickly and more efficient (for example: Suspend-And-Resume functionality to stay in the zone). Testing became a true first-class citizen in the development process with a unified Test Explorer in Visual Studio and a unique way to perform automated and exploratory testing from Microsoft Test Manager. Team Foundation Server 2012 provided also a server monitoring solution for teams that use or want to adopt System Center Operations Manager (SCOM). 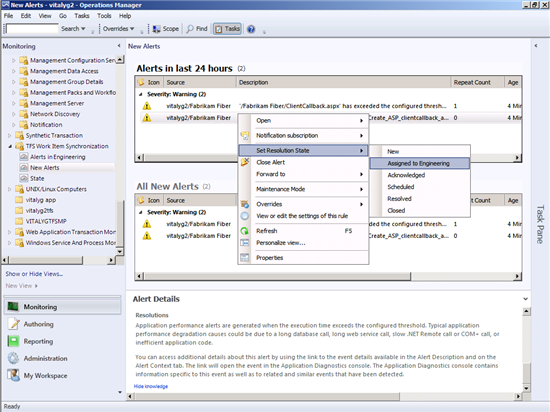 A monitoring agent can be installed/configured for ASP.NET applications running on a web server. This agent collects rich data about exceptions, performance issues, and other errors. Using the TFS Connector for SCOM, Operations staff can file these exceptions as operational issues (work items) in TFS and assign them to the development team to investigate in order to improve and fix production web applications. 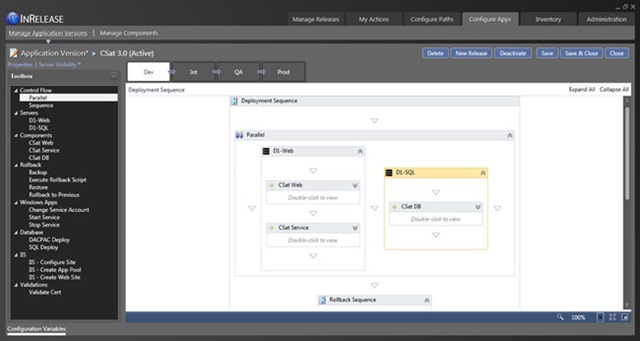 Visual Studio and the TFS connector, in conjunction with SCOM, provide a real-time improvement feedback loop for server-based applications deployed in production environments, leading to continuous improvements, an increased mean time to repair (MTTR) cycle and better quality in the end of the application in production. More importantly, Microsoft has also been working very hard on an ALM “cloud” offering in this timeframe: Team Foundation Service or Team Foundation Server in the cloud. A preview of Team Foundation Service was announced for the first time at the BUILD Conference in 2011 and the public launch was communicated on June 11 of 2012. What started as a technical experiment to get TFS running on Windows Azure eventually evolved into a new product which also completely shifted the release cadence for new Team Foundation Server releases. More info on this in one of the next paragraphs. The cloud version of Team Foundation Server provides (small) development teams easy access to ALM features (Version Control, Agile Collaboration and Automated Builds) without having to install and manage the server application on-premises. Not all existing on- premises TFS features like Reporting and Lab Management are available in Team Foundation Service, but it’s clear that this offering is quite compelling for small companies that want to be instantly up-and-running with the foundations of Application Lifecycle Management. Also in 2012, Microsoft announced (basic) Git integration with Team Foundation Server via the open source Git-TF solution (http://gittf.codeplex.com/) which offered a set of cross-platform command line tools (running on Windows, Mac and Linux) for sharing version control changes between TFS and Git. 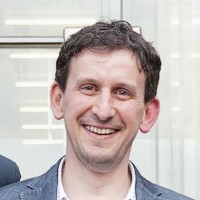 Instead of building their own Distributed Version Control System (DVCS), Microsoft decided to embrace Git (the most popular DVCS solution on the market) even more when it was publicly announced in January 2013 that Team Foundation Server would host genuine Git repositories and Visual Studio would get native Git support for managing local and hosted repositories. I remember Brian Harry introducing that idea in a private NDA event at the MVP Summit in February 2012 (almost a year before the public announcement). There were mixed opinions internally in the TFS product team, but for the Visual Studio ALM MVP group it sounded immediately as the way to go: adopt the best DVCS solution in the market! I’m still very glad Microsoft eventually took this decision because it’s nowadays actually adding extra value for DVCS workflows in Visual Studio on top of Git instead of playing catch up with Git by building their own “Microsoft” DVCS solution. Git didn’t have the best client development experience on the Windows platform in the past, but with the Visual Studio Tools for Git, developers are getting native support for managing Git repositories inside Visual Studio and they could also target hosted Git repositories in Team Foundation Service. 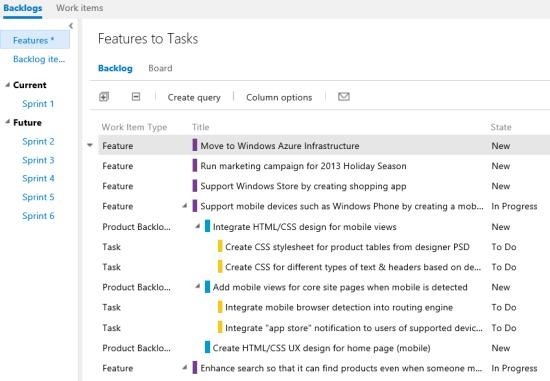 Including Git in the broad ALM vision of Microsoft resulted today in an integrated enterprise-ready ALM offering with Git: version control, work item tracking and build automation. It’s good to see that Microsoft is now actively working together in the open-source space to provide the best possible experience for software developers and it strengthens Microsoft’s presence on non-Windows platforms. 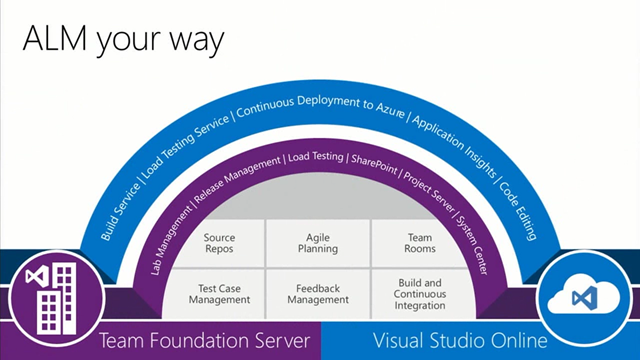 As from the beginning, Team Foundation Server has been a boxed product which had a 2 to 3 year release cycle. Bringing TFS to the cloud started a new unknown era. Rolling out fixes/updates for an on-premises product or for a cloud service is totally different. Imagine a cloud service which doesn’t update for a long period of time. People would assume it’s dead and forgotten. Customers of TFS in the cloud expect the product to evolve much faster than a boxed product and a service in the cloud must always be “on”. Delivering small and big updates to Team Foundation Server (different on-premises versions + cloud) was a big challenge for the TFS Product Team, but they managed to get it aligned pretty well now. Team Foundation Service will always be the front-runner and is updated every three weeks with features enabled/disabled by feature flags. Many features you will detect in the cloud may not be present for quite some time in the version of TFS you are running on-premises. On average, updates to VS/TFS (on-premises software) are pushed in a quarterly update and new major versions of TFS will be released yearly. Part VI will cover the latest release of Visual Studio and Team Foundation Server: VS and TFS 2013. Stay tuned! What about cross-platform development in the early versions of Microsoft Visual Studio Team System? Microsoft did not have a solution for this. Teamprise – founded in 2006 as a division of SourceGear – developed a suite of client applications for accessing Microsoft Visual Studio Team Foundation Server from outside the Visual Studio client environment. Teamprise enabled developers to use the source control and work item tracking features of Team Foundation Server from other platforms (operating systems that support a Java Runtime Environment), including Linux, Solaris and Mac OS, and from within the Eclipse IDE through a plug-in. This plug-in was also compatible with IBM’s Websphere Studio and Rational Application Developer IDE. 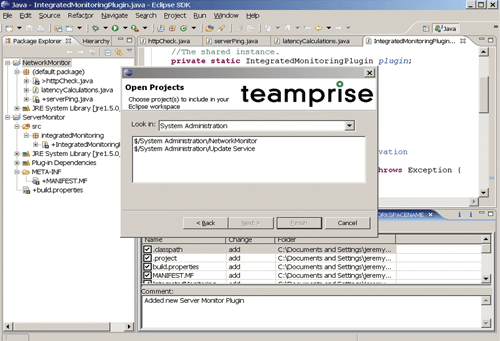 There was also a stand-alone Teamprise client application (written in Java) which featured an Explorer-style user interface for developers not working within an IDE. The product was written by accessing the Team Foundation Server SOAP web services. A bit later in 2007 the company also started working on a Java SDK for use with Team Foundation Server. Big enterprises and third-party software vendors were interested in using libraries developed by Teamprise in order to link existing Java products with Team Foundation Server data. This addition was opening up a large set of core libraries to expose functionality to Java developers in the form of an API they can use to build their own TFS-enabled applications. Back in November 2007, Microsoft released a new version of the Team System product: Visual Studio Team System 2008. This release can be seen as the first update to the Team System brand. Visual Studio 2008 Team Foundation Server delivered improvements in several areas, such as enhanced features in Team Build and version control, better performance, scalability and more flexible configuration. But it was only in November 2009 that Microsoft acquired Teamprise to provide cross-platform support for Visual Studio. It was announced that functionality from the Teamprise Client suite would be integrated into the Visual Studio product line, beginning with the next version of Visual Studio (Visual Studio 2010). TFS in combination with the Teamprise Client Suite technologies would enable development teams to use a single tool to overcome core development challenges, regardless of the core platform in use. This decision by Microsoft was a commitment to provide ALM tooling support across the entire enterprise, a desire to avoid the artificial technological boundaries inside big companies. Heterogeneous development was at that time officially a new focus for the TFS/ALM product team inside Microsoft and the old TeamPrise (Java) developers joined the team. A few months later in April of 2012, Microsoft came up with a (temporary) name for the product: Microsoft Team Explorer 2010 codename “Eaglestone”, or TEE in short. The Program Manager for the new addition to the Visual Studio product suite was Martin Woodward, a senior software engineer from the former TeamPrise employees. At the global Visual Studio 2010 launch event in Las Vegas (April 2010) Visual Studio Team Explorer Everywhere (TEE) was announced. 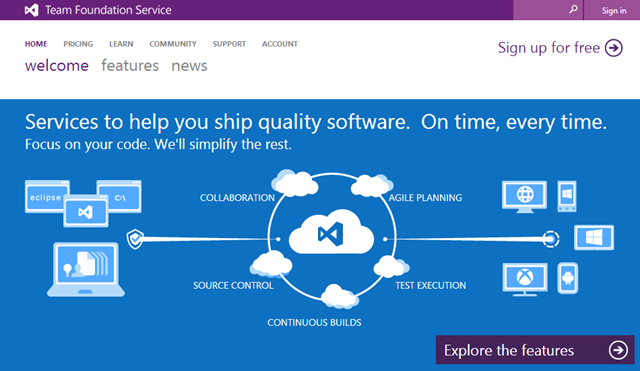 The Teamprise features were now completely integrated and part of the Microsoft solution set for development teams. 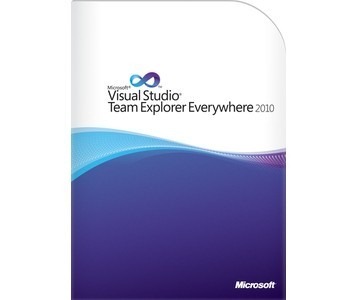 Previously sold as a separate product, Visual Studio Team Explorer Everywhere 2010 works with your favorite Eclipse-based IDE, in the operating system of your choice, and helps you collaborate across your .NET and Java development teams using Team Foundation Server 2010. It’s an easy-to-install standalone plug-in that’s now a free download. Java developers of course also need to run builds and are adopting continuous building/integration practices. So, why not provide this via TFS Builds? The Team Foundation Build Extensions (to be installed on the Team Foundation Build Agent) offered the ability to execute Ant or Maven 2 builds from Team Foundation Server and publish the results of the build along with any associated JUnit test results back to Team Foundation Server. This release was compatible with Team Foundation Server 2005, Team Foundation Server 2008 and Team Foundation Server 2010. Team Explorer Everywhere and the Build Extensions got also updated in the newer versions of TFS to improve the Team Explorer experience in the non Visual Studio world. I would also like to add a link here to a previous blogpost I made in March 2012, where I write more in detail about the benefits Team Foundation Server may offer in a heterogeneous software development environment: TFS as a true cross-technology ALM platform. Next Part (Part IV) will tackle the integration of new Testing tools into the ALM solution with the release of Team Foundation Server 2010.